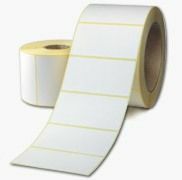 CDM Labels are able to provide a full range of direct thermal (DT) labels for desktop printers with a maximum roll diameter of 127mm (5") on 25mm or 38mm cores. We are also able to supply direct thermal labels on 76mm (3") cores for industrial printers. Our range of labels include Economy Labels, Top coated labels with a choice of permanent, removable and freezer adhesives. 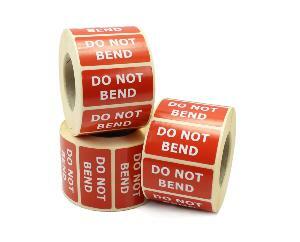 Highly visible labels / stickers in a variety of styles and sizes. 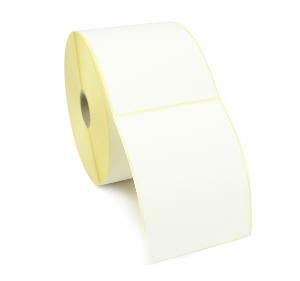 These parcel / shipping self adhesive labels have a permanent adhesive and are supplied on rolls. Easily peel and stick the labels onto your boxes, cartons, envelopes and packages to alert handlers to the how contents should be handled to avoid damage to your goods. A full range of parcel / shipping warning labels suitable for most mailing / shipping applications. If you do not see the design of label you are looking for, please contact our sales team as we are able to print any label that you require in both small or large quantities. 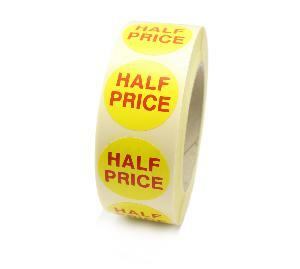 A full range of promotional labels for all retail environments. If you do not see the design of promo label you are looking for, please contact our sales team as we are able to print any label that you require in both small or large quantities. Highly visible labels / stickers in a variety of styles and sizes. 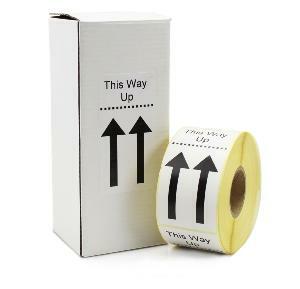 These self adhesive mailing labels have a permanent adhesive and are supplied on rolls. Easily peel and stick the labels onto your boxes, cartons, envelopes and packages to alert handlers to the postage / courier service required for your items. A full range of mailing labels for suitable for most postage / shipping applications. If you do not see the design of label you are looking for, please contact our sales team as we are able to print any label that you require in both small or large quantities. CDM Labels are able to provide a full range of thermal transfer (TT) for desktop printers with a maximum roll diameter of 127mm (5") on 25mm or 38mm cores. We are also able to supply thermal transfer labels on 76mm (3") cores for industrial printers with a maximum roll diameter of 208mm (8"). Our range of labels include semi-gloss, vellum, vinyl and many other materials and adhesives. 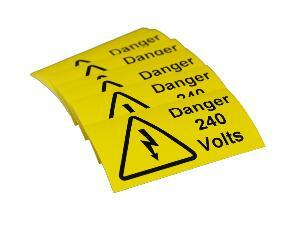 CDM Labels manufacture in house electrical warning labels of various sizes and quantities to suit most applications. The labels are manufactured from high grade semi gloss material with a permanent and self adhesive backing. The electrical warning labels clearly highlight the hazards and dangers from the use of live electrical equipment. Our range electrical safety labels covers appliance voltages, safety connections, isolation and safety devices, inspection and pat testing labels. The range of electrical safety labels have internationally recognised electrical symbols, and clearly identify risks to employees and maintenance engineers of dangers of injury from electricity.